What are the best words to describe the current condition of your kitchen? The center of beauty and creativity or a place of chaos and clutter? 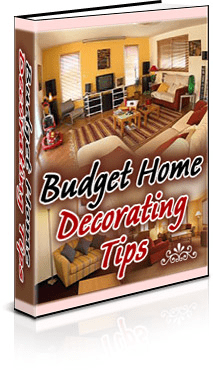 If the answer is the later one, you need to work with the décor ideas for your kitchen. Don’t worry! You don’t need to buy that fancy decoration. You can make one by yourself. At the end of a packed day, most of us will spend a lot of time to think about the best dish to have for dinner. To ease the planning of dinner menu, we surely need meal plan for the week. 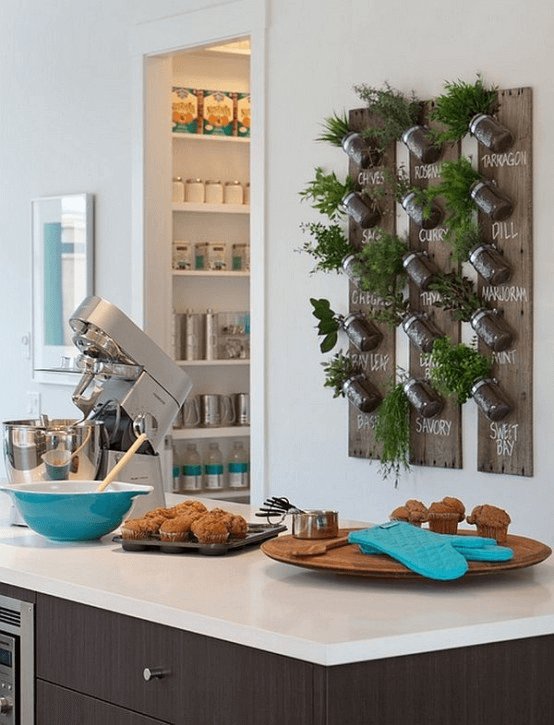 This need of having meal plan can create an idea of creating a kitchen decoration which is menu board. It is an easy project to make. The materials are also easy to find. All you need are plywood, wood coasters, and frame pieces. This menu board could help you plan your weekly meals and thus ease your grocery shopping for the cooking materials. In short, this menu board could really help you get your dinner more organized. Here are the steps to make it. First, measure the frame pieces and thus cut your plywood to make it fit. After that, you need to paint the plywood using the paint of chalkboard. Meanwhile for the frame, you can have fun with the color. One of great choices for the color of the frame is teal color. You could absolutely go with the color of your choice. What is the use of the coasters then? Well, they could play a role as the board of writing the days of the week. Those coasters are then stuck to the board. To stick the coasters to the board, you could use liquid nails. In this step, there is an important point to remember which is equally spacing the coasters apart. To do this job, you could get a help form two yard sticks. What you need to do is simply moving the sticks around accordingly. When you stick the coasters to the board, make sure the nail attach them perfectly so that the coasters won’t fall down. The next step is writing the letters of the name of the days on those coasters. To write these, you could use a marker with black paint. As we cannot make the board very big, you don’t need to write the name of the days with a complete spelling. Simply choose the first letter of each day of the week to indicate the name of the day. For example, use “M” for Monday, “T” for Tuesday, “Th” for Thursday, etc. Once you are done writing those letters on the coasters, you could grab your white chalks to start writing the plan for the dinner meal for the week. Now you and your children could easily see what they could expect to eat in every dinner. This menu board definitely makes the meal planning easier and the grocery shopping hassle free! While this menu board is great for planning dinner meal, this board is also great for organizing schedules for the week, activities, and appointments. 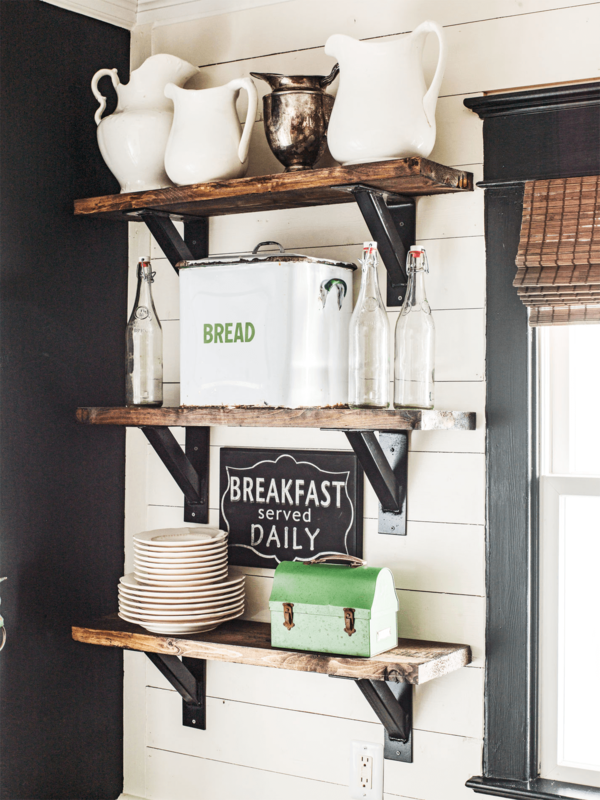 Another great DIY decorating idea for your kitchen is a floating shelf. This DIY project is easy and simple. Even you can make the floating shelf quickly. This floating shelf is a nice place to display your favorite plants or succulents or simply any home décor items that you like. This decoration item will surely be a nice addition to your kitchen especially if you are a plant lover. 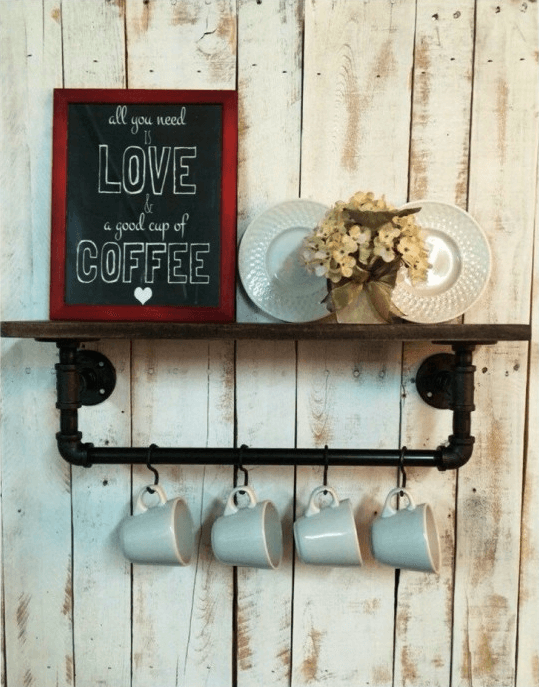 Besides, this floating shelf will also be a great addition to your kitchen that carries minimalist design with a little twist of bohemian touch. To make this floating shelf, the materials you will need are scissors, yarn, and round wooden plate with any size depending on the plant or decoration item you want to display,. Yup! You will only need to prepare three materials. They are indeed easy to find in the nearest store! Now, let’s find out the steps to make it. First, cut more or less 48 yarn pieces. You can go with more number of yarn pieces. After that, make a knot at the center of those yarn pieces. The knot will be the centerpiece of the floating shelf’s hanger. Next, divide all the yarn pieces into 4 equal sections. If the total of the yarn pieces you have is 48 then each section has 12 pieces. Divide accordingly. The next step will be dividing each section into two equal parts. In here, as each section has 12 yarn pieces, so each part of the section has 6 yarn pieces. After that, twist each part together. Another option for doing this step is to separate the sections into three and then to braid them. Next, hang the piece in anyplace that high. Then make a knot at approximately four inches under the top. Make sure you make a strong knot. Finally, make another knot at the bottom. Once you make sure that every knot is firm, you can slip the wooden plate on. After that step, you have many options to give the floating shelf a finishing. You can stain the wooden plate or you can simply the wooden plate in its natural look which is the color of wood. If you prefer to stain it, make sure you choose the right shade so that the floating shelf can match the colors of other furniture or the colors of the items you want to put on the wooden plate. This is just for making a good color harmony. The very last step is of course arranging the decoration items on the wooden plate. You can arrange succulent planters or other small decoration items on it. Your floating shelf is now ready to add a new touch to your lovely kitchen. 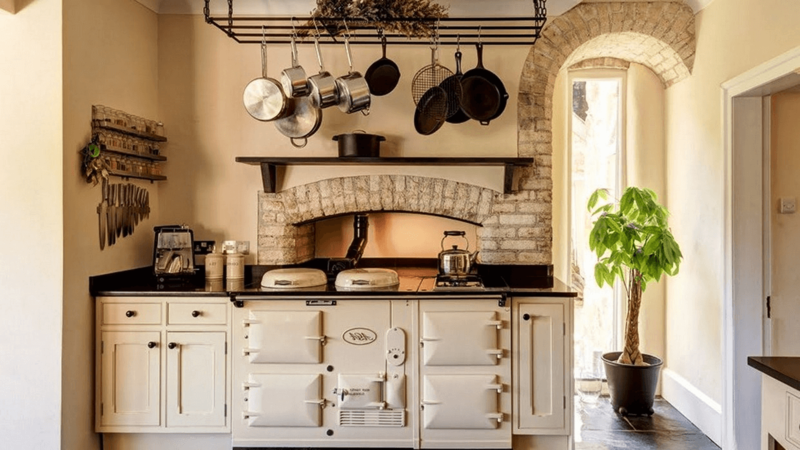 Giving a new decoration item to a kitchen doesn’t necessarily mean spending lots of money to make a purchase in stores. We can simply occupy our creativity to make DIY decoration items to decorate our lovely kitchen. For those of you who like plants, you can try this method. How to make it easy. 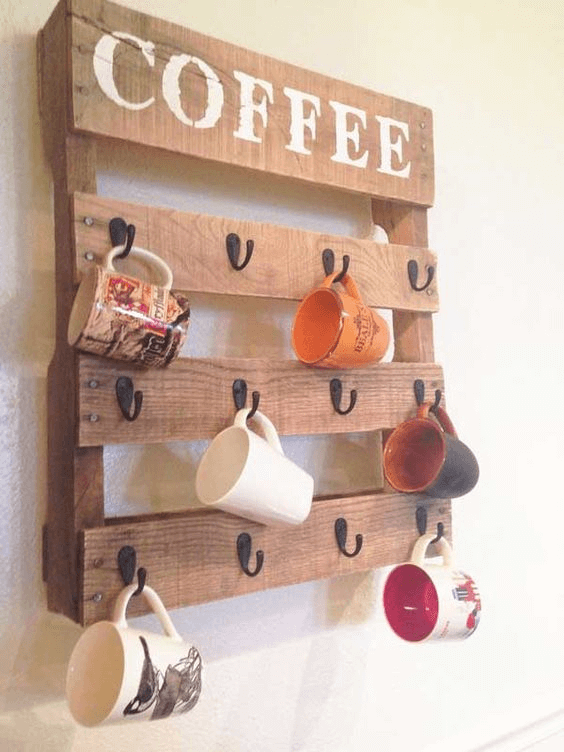 If you like coffee, this kitchen decorating idea will be interesting, coffee cup hangers. What do you think, is this interesting enough. 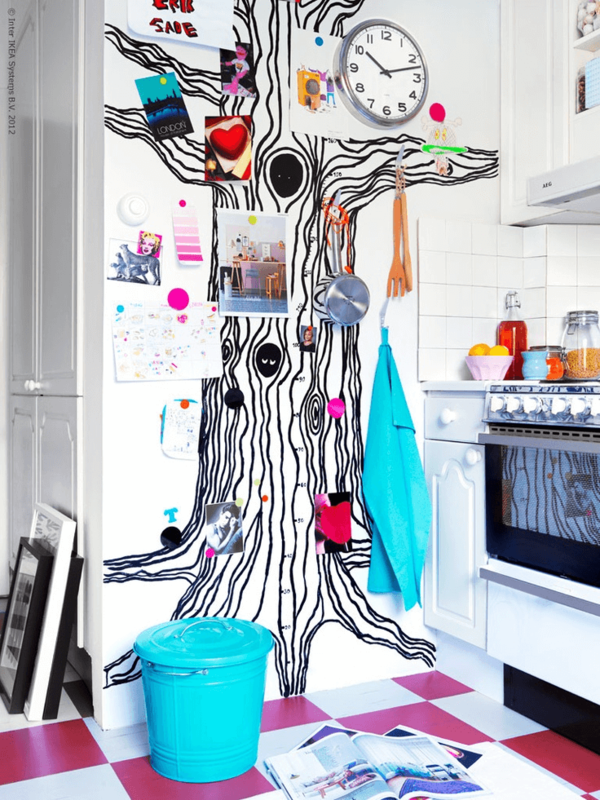 Let’s be creative with our kitchen. Good luck. If you want to imitate this idea, here are the tips. For the motif, you can adjust it to your own taste. The tree motif with hanging roots is also interesting, and easy to make. Abstract themes are also interesting. In essence, your creativity is very necessary in this matter. Next post How to Clean Formica Table Top in Few Minutes!